Ex15.1, 6 (Method1) A bag contains lemon flavoured candies only. Malini takes out one candy without looking into the bag. 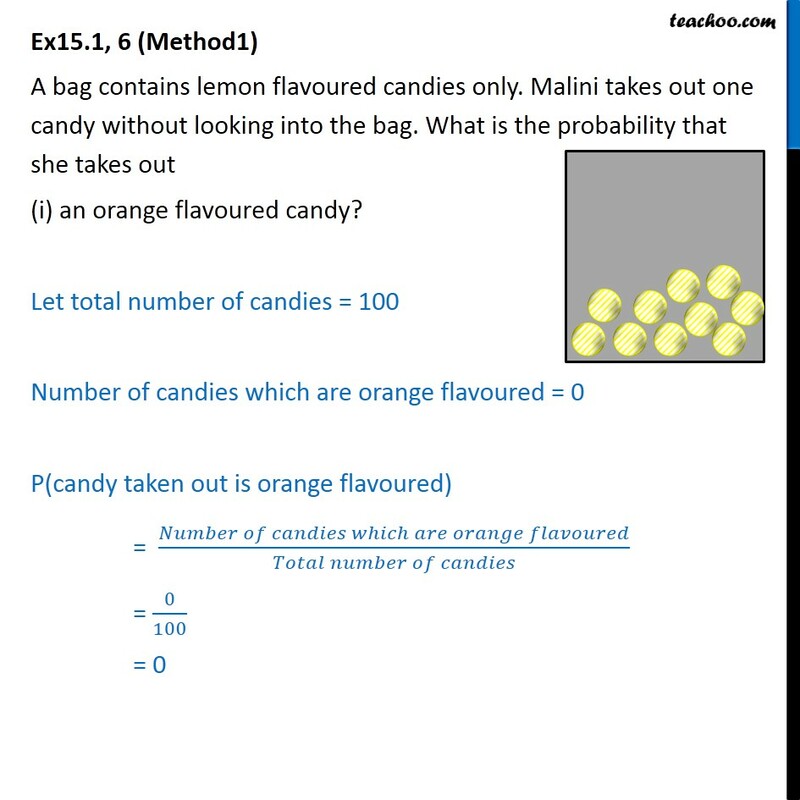 What is the probability that she takes out (i) an orange flavoured candy? Let total number of candies = 100 Number of candies which are orange flavoured = 0 P(candy taken out is orange flavoured) = (𝑁𝑢𝑚𝑏𝑒𝑟 𝑜𝑓 𝑐𝑎𝑛𝑑𝑖𝑒𝑠 𝑤ℎ𝑖𝑐ℎ 𝑎𝑟𝑒 𝑜𝑟𝑎𝑛𝑔𝑒 𝑓𝑙𝑎𝑣𝑜𝑢𝑟𝑒𝑑)/(𝑇𝑜𝑡𝑎𝑙 𝑛𝑢𝑚𝑏𝑒𝑟 𝑜𝑓 𝑐𝑎𝑛𝑑𝑖𝑒𝑠) = 0/100 = 0 Ex15.1, 6 (Method2) A bag contains lemon flavoured candies only. Malini takes out one candy without looking into the bag. What is the probability that she takes out (i) an orange flavoured candy? The bag contains lemon flavoured candies only. It does not contain any orange flavoured candies. So every time, she will take out only lemon flavoured candies. 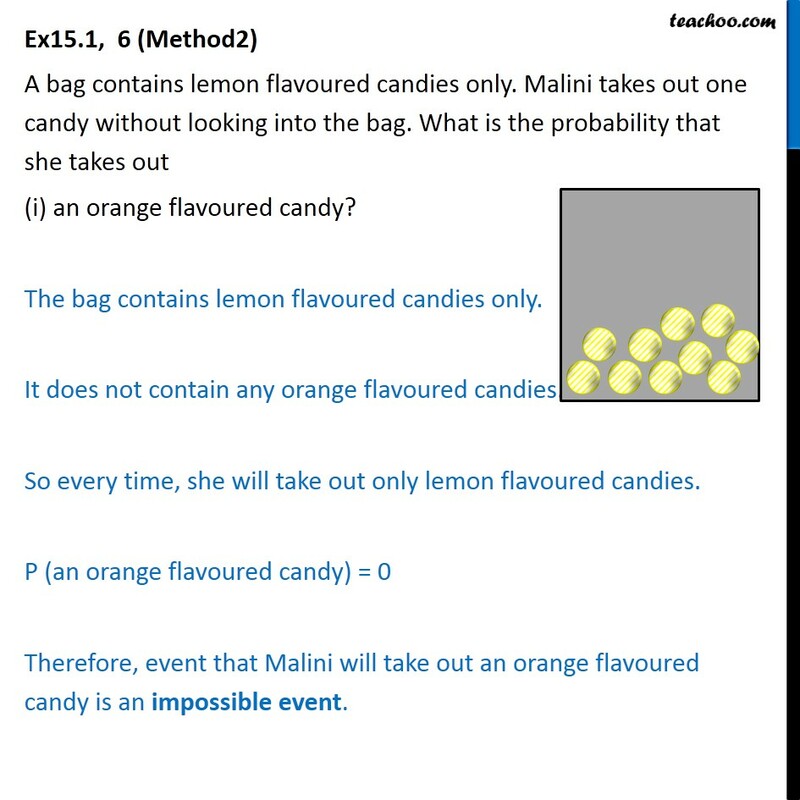 P (an orange flavoured candy) = 0 Therefore, event that Malini will take out an orange flavoured candy is an impossible event. Ex15.1, 6(Method1) A bag contains lemon flavoured candies only. Malini takes out one candy without looking into the bag. 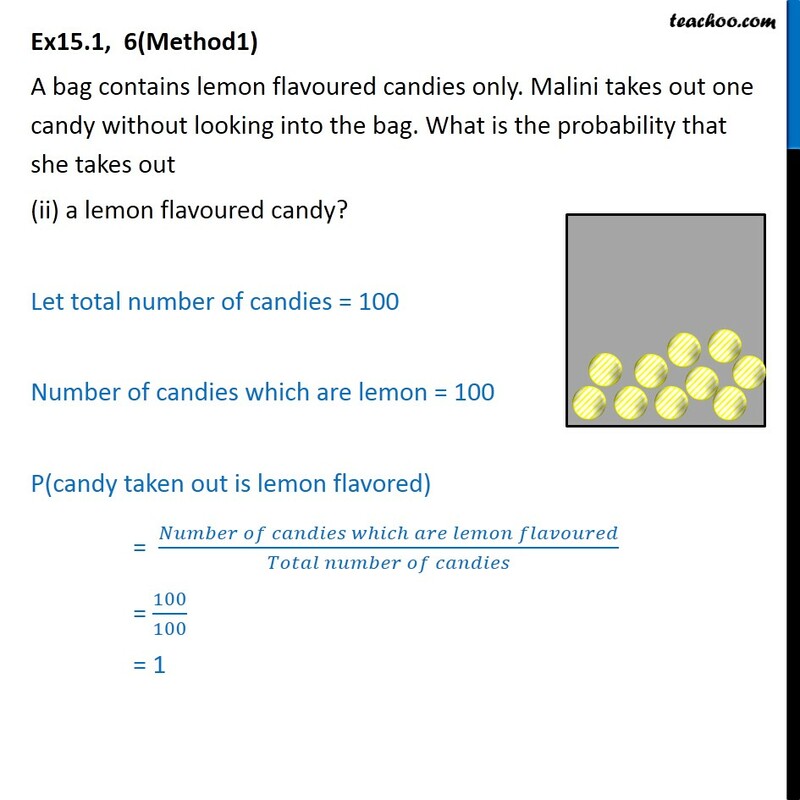 What is the probability that she takes out (ii) a lemon flavoured candy? Let total number of candies = 100 Number of candies which are lemon = 100 P(candy taken out is lemon flavored) = (𝑁𝑢𝑚𝑏𝑒𝑟 𝑜𝑓 𝑐𝑎𝑛𝑑𝑖𝑒𝑠 𝑤ℎ𝑖𝑐ℎ 𝑎𝑟𝑒 𝑙𝑒𝑚𝑜𝑛 𝑓𝑙𝑎𝑣𝑜𝑢𝑟𝑒𝑑)/(𝑇𝑜𝑡𝑎𝑙 𝑛𝑢𝑚𝑏𝑒𝑟 𝑜𝑓 𝑐𝑎𝑛𝑑𝑖𝑒𝑠) = 100/100 = 1 Ex15.1, 6(Method2) A bag contains lemon flavoured candies only. Malini takes out one candy without looking into the bag. What is the probability that she takes out (ii) a lemon flavoured candy? Bag has all lemon flavoured candies. So, Malini will take out only lemon flavoured candies. 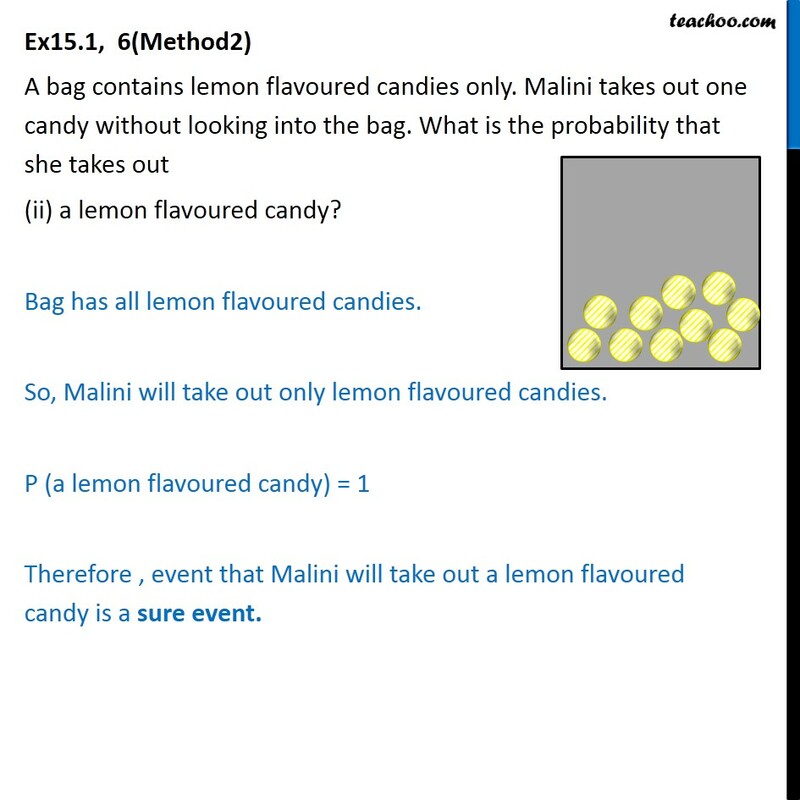 P (a lemon flavoured candy) = 1 Therefore , event that Malini will take out a lemon flavoured candy is a sure event.